The Duluth Aerial Transfer Bridge operated very much like a streetcar trolley, and indeed ran on streetcar motors. Duluthians lucky enough to have ridden on the bridge remember that it rode very smoothly and wasn’t too loud—you didn’t have to shout to have a conversation during a crossing. And like a streetcar, operators used a removable handle at the “front” of the ferry car to set the bridge in motion; for the return trip, the handle was moved to the other end of the car, now moving in the opposite direction. Only a handful of people operated the ferry bridge, including long-time bridge boss Leonard Green. Thomas White started in 1905 and in 1918 became the only operator to die on the bridge. John Hicken also started on the bridge that first year and stayed on the job until his death from pneumonia in 1928, just a year before the bridge was converted to lift. That year a newspaper article on Hicken estimated that he had traveled 120,000 miles—300 feet at a time—and had taken on 25 million passengers before 1923. But Hicken wasn’t worried about stats. “What’s a couple million people between friends,” he joked with the reporter. 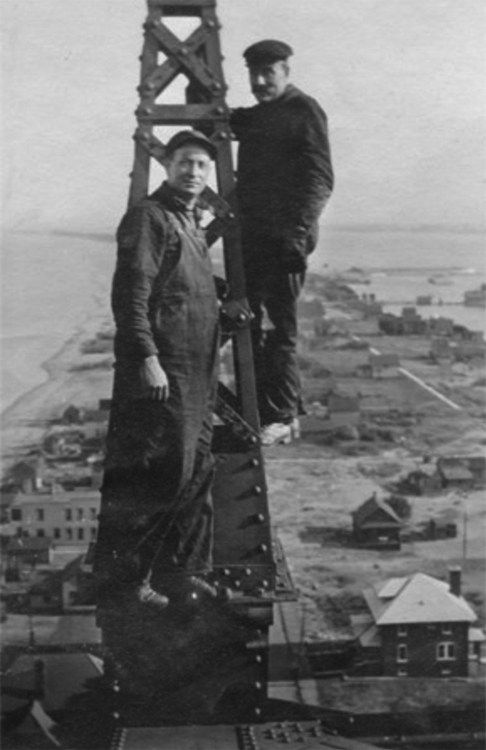 He was looking forward to working on the lift bridge except for one thing: his work day would go by without the companionship of his passengers. William Maynard worked the bridge from 1916 to 1918, then returned in 1932 to operate the lift bridge for another thirteen years. James Murray began as an operator in 1924; when the span converted to lifting he worked as “Special Police” for the bridge. Urban Nehring joined the crew just a year before the conversion and stayed on until 1942. The very first “Bridge Superintendent,” Leonard Green saw the transfer bridge through all but the first three years of its life, then stewarded the aerial lift bridge for the first fourteen years of its life. A lifelong Duluthian, Green had worked the big lake as a sailor for years, working his way from fireman to marine engineer. 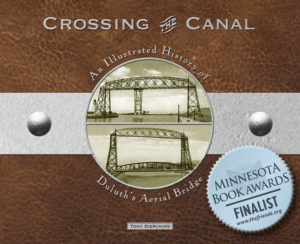 He crewed on several tugs in the Duluth-Superior Harbor, including various fishing boats operated by the A. Booth fisheries, the Corona and the steamer Bon Ami, the first vessel to pass under the Duluth Aerial Transfer Bridge from the lakeward side in 1905. Before coming aboard the bridge, he worked as a stationary engineer for Duluth’s grand Spalding Hotel. In 1943 Green told the press he considered operating the bridge “the perfect job for an ex-sailor… It’s a good job, and I like it.” Sixty-two years later, his daughter Dorothy Hubert emphasized that point, telling reporters, “The bridge and the harbor were his life. Even when he was home, he was very aware of what was going on in the harbor.” He may have loved the ferry bridge, but he also recognized when it was becoming obsolete. He told the paper that as the ferry bridge neared the end of its life, lines of waiting vehicles stretched for blocks, and many drivers cursed him for the delay. “The present bridge certainly is an improvement over the other one,” he said. Green treated his crew like family. In 2005 Hubert told the Duluth News Tribune that the crew often got together socially, sometimes getting their families together as well. “They’d all get their wives and go out for a big picnic once a year,” she said. “That was always fun. He worked well with his men. He thought a lot of them.” Besides Dorothy, Green and his wife Helen raised three other children in their home in Duluth’s East Hillside neighborhood. Green lived his entire life in Duluth and never retired. He died of a stroke in 1944. Frank Lampert temporarily took over supervisor duties until 1946, when Al Hass became only the second man in fifty years to officially hold the title “Bridge Superintendent.” Unlike Green, an old sailor, Hass had a much less likely start for a bridge operator: his first job was in a lumber camp, far from any marine activity. Born in Triumph, Minnesota (near Albert Lea), in 1902, Hass and his family moved to Tenstrike (northeast of Bemidji) in 1911 where he eventually went to work in the logging camp. He moved to Duluth in 1926 (his wife’s doctor suggested the move to relieve her hay fever suffering) and sold vacuum cleaners as he studied for an electrician’s license, which he parlayed into a job with Commercial Electric. By 1929 he was working on the bridge’s electric components during its conversion from a transfer bridge to a lift bridge. When he finished his work for Commercial Electric, he went to work on the bridge as one of its operators. He had already impressed Leonard Green with his work on the bridge conversion, so Green only had one question for him at his interview: “Are you used to heights?” After Hass explained that his work previously required him to climb telephone poles, he got the job. As bridge boss, Hass’s problem-solving abilities came in handy. He extended the life of the bridge’s batteries, worked on ways of protecting the radar antenna from falling ice, and tried to devise a way to prevent people from attempting to cling to the bottom of the bridge and “hitch a ride,” a problem that has plagued operators since the bridge’s 1929 conversion. During his tenure on the bridge, the operators house was warmed by a coal-fired stove, and operators had to carry the coal in bags slung over their shoulders, a two-story climb. (None of the operators appreciated this aspect of the job, and some turned it into a bit of a game, making sure to leave just a single chunk of coal for the next operator on duty simply to avoid making another trip to the bin and back.) It was also on his watch that the bridge operators’ ritual lunchtime cribbage matches came to a halt. “Someone complained to the city fathers and we had to quit,” he explained. Hass and his first wife Edith raised two children in Duluth before her death in 1963; he later remarried and became the stepparent of his wife Lorraine’s three children. Hass died in 1993, twenty-five years after retiring in 1968. His thirty-seven years on the bridge was the longest any one person worked on the span.